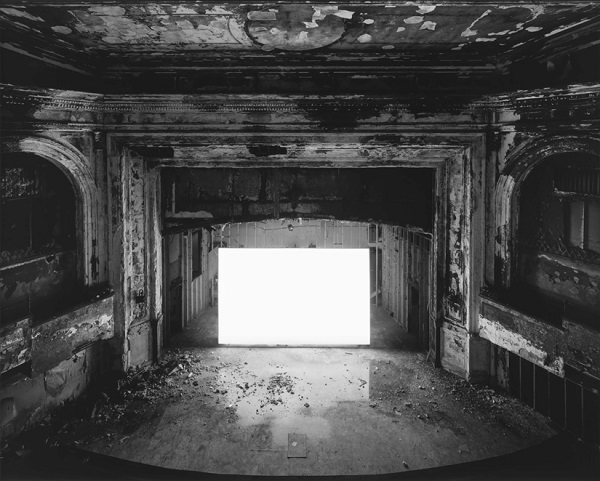 Franklin Park Theater, "Rashomon" 1950, Boston, 2015A, Hiroshi Sugimoto. Great ideas are tempted by empty stages. When we hear the popularized term “holding space,” more often than not, it relates to something in the metaphysical sphere. But lately, when I apply the principle more literally, it offers interesting relevance in the real world. It’s especially true when conditions need to change, or the shape of something seems to be asking to evolve into its next incarnation, but I don’t know what to “do” about it. On most Tuesday mornings, I take part in a morning dance rave at a nearby studio. It’s not a popular offering (yet) and, truth be told, at times I’ve been one of only two people in attendance. She, by opening the doors, putting it on the schedule, turning on the music and turning down the lights; Me, by planning for it, and then showing up. Taking it one step further, we’re both betting that something good will come from an open-ended question of sorts. With no agenda, only intention, it allows for answers, downloads and insights; about what, we don’t know ‘till we do it. But it does require some trust and an adjustment of traditional expectations. If I expected a crowded, mind-bending Burning Man experience that opened the door on a new quantum universe, I might be disappointed. If she expected a packed house and commensurate fees, she’d be equally bummed. You plan, you craft – roll up your sleeves on a project, service, piece of work – and the applause is light at best, or at worst, inaudible. Maybe you can point to a variety of reasons why, or not, but the takeaway is the same; zero bodies, dollars, likes, ROI…and seemingly little progress. But…that’s what’s great about holding space for a thing; It’s an approach that takes time and practice, more than strategy and tactics. It’s adjacent to uncovering the answer, and less direct. But it’s surprisingly effective when you have that luxury to do it. Taken further, I’m thinking of the people or circumstances you want to enter your life, the new energy, the answer, the opportunity – the right dynamic. Sometimes, all you can do is make room in your mind and schedule for those things to make an entrance – because nothing else seems right / clear / possible. You can take all the proscribed steps as well, and should. But just as meditation is often an exercise in not doing something, holding space is being there with intention and attention to see…what unfolds. When we “hold”, we invite potential. There’s stillness in it – that ironically, instigates movement. It’s not proscriptive or instructed. It requires getting body and mind in one place – off-device, on-alert. I don’t go into my dance rave asking for ideas, but the very act of free movement, with no teacher, no program or method, invites a certain cascade of thoughts that can form something worthwhile. I can’t predict it nor do I look for it.